Until fairly recently, bigfoots have had it easy. They pretty much had the entire night to themselves. Sure, campers, owl hooters, and the like were out in the woods at night, but they couldn't see past the beam of their flashlights. Humans are, after all, pretty worthless in the thick woods after dark. Technology is changing some of that. Night vision and thermal imaging technologies are allowing people to peer behind the veil of darkness that has hidden the world of the sasquatch from us for so long. Just in case you aren't on the cutting edge of bigfoot technology, let me briefly explain thermal imagers and night vision. Thermal imagers ("therms") see heat, which is just infrared light. This is not the infrared light that is emitted by your Sony Nightshot camera or the cheesy IR illuminators found on many security cameras. Those are the near-IR wavelengths (which I strongly suspect sasquatches can see), and they bounce off of things like normal light does. What thermals see is appropriately named "thermal-IR" and is not reflected off of objects, but rather emitted by them because of some fancy science that is happening at the atomic level. For our purposes, it would be enough if you understood that the hotter something is, the brighter it is through a therm. Some therms have a color display, with various shades representing various temperatures, but most of the lower-end therms used for bigfooting have black and white displays where the whiter the image is, the hotter the thing is that you're looking at. What Roger and Bob would have seen with a thermal imager. In the meantime, I thought it would be a fun and useful experiment to do some filming in the woods. I have already started collecting thermal video footage of other animals, including primates. I now wanted to see what a human would look like through a thermal imager in hopes to somehow contribute to the analysis that will be done on future bigfoot videos. When I was at the Yakima Bigfoot Round-Up, I was having a conversation with Dr. Jeff Meldrum about these experiments. He told me that whoever does these experiments would have to do it naked. "I took one for the team, Doc!" was my reply. Dr. Meldrum just laughed and shook his head. 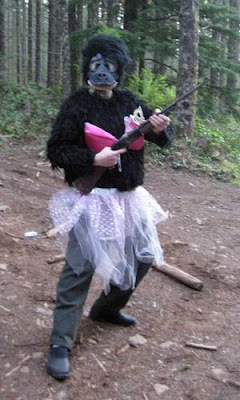 dressed like this for bigfoot experiments? Below is a short video clip of a human (me) running around in the woods, acting like a sasquatch being filmed through a thermal imager. I was wearing a light outer shell and jeans in the first segment, nothing but a smile and boots in the second segment, and then a ridiculous ape suit in the third segment (though without the lace skirt you see in the photo above). The clip is just shy of two minutes in length. It was edited from a longer segment that I hope to assemble into a DVD for future release. On a side note, playing ape in the woods makes one want to throw rocks and howl. Try it for yourself, if you don't believe me. It's kind of liberating. Very interesting, I enjoyed your experiments. Interesting how much noise you made running through the brush. Also interesting that you looked "human" in all the versions, despite trying to look ape-like, it’s the proportions I think (leg length, arm length, etc.). Personally I find the dog (I'm assuming it was a dog anyway) in the second video interesting in that it gives an idea what a fur/hair covered animal would look like. Love it! Great job as this needed to be done so those that haven't used one of these units can see for themselves the different deviations we've seen (before rushing to always comment:)). Still trying to figure out if the clarity changes on different nights though as I saw Leiterman in his clothes clearly from 70 yds Sat night on a straight road in Yakima. I think that's the farthest I've gone without the subject being just a lit "corona" like you are naked in the example. Call you tomorrow as.... as soon as Greene gets that footage back up, I'm going to have someone from Raytheon in WA examine it. That a boy, you rock-throwing freak! "(before rushing to always comment:))"
Whoops, LOL. Should've clarified I meant inexperienced persons commenting on other forums (not here) on the scientific potential or supposed lack thereof, of thermal. Just out of curiosity, how long did you have the rock in your hand before you threw it? I'm surprised how much heat it absorbed. I had the rock in my hand for perhaps 5 or 10 seconds, but probably much less than that. It is glowing brightly from the heat it had absorbed throughout the day. Rocks always look quite bright though therms. We have just added your latest post "Thermal Imaging Experiments: Taking One for the Team" to our Directory of Science . You can check the inclusion of the post here . We are delighted to invite you to submit all your future posts to the directory and get a huge base of visitors to your website. was your dog being sick??? 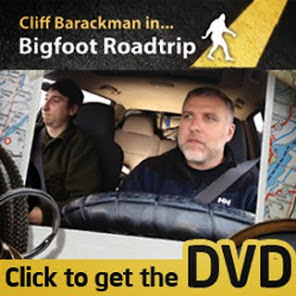 Cliff: Great job on the experiment, and very interesting how well you performed Bigfoot type behavior. My favorite part was how you ran alot faster while doing the naked segment.